This old retaining wall was damaged by flooding during Hurricane Sandy. We install either a wall anchor system, like our Geo-Lock™ Wall Anchors, or helical tieback system along the retaining wall to reinforce the structure. We have warrantied solutions for failing retaining walls! Call us for a free retaining wall repair quote today! We serve Victoria, San Antonio, Laredo, and many nearby areas in Texas. To repair retaining walls, we at Foundation Supportworks, Inc. typically recommend either wall anchors or helical tiebacks to restore structural integrity. We Repair Retaining Walls In TX! At Foundation Supportworks, Inc., we provide warrantied solutions for retaining wall repair throughout Texas. For homeowners interested in learning more about their unique problem, we offer free, written retaining wall repair quotes at no obligation. To schedule an appointment with one of our specialists, call or e-mail us today! 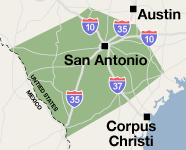 We proudly serve Texas areas such as Eagle Pass, San Marcos, New Braunfels, Seguin, Kerrville, Beeville, Del Rio, Universal City, Uvalde, Boerne, Converse, Schertz, Lockhart, Floresville and nearby.